Race Registration Opens - 8:00 a.m.
Race Registration Closes - 9:30 a.m.
What is the Stop, Drop & Mud? We are proud to be bringing a mud run to Mountain Ranch again this year. For our 2nd Annual Central Fire Mud Run we are planning approximately 16 obstacles along the route that will range from fire fighter skills to strength and endurance tests. Participants will start and finish at the Mountain Ranch Park in the heart of Mountain Ranch. All participants will receive a 2018 Stop, Drop & Mud T-shirt. Participant are welcome to walk or run the course. All obstacles are designed to be challenging but are accomplishable by people of all ages and abilities. Obstacle course races have become one of the most popular events in the running world in the last five years. There are races out there that have you run through mud, bounce down slides or even get splattered with paint. We wanted there to be more of a firefighter theme to this run. The Stop, Drop & Mud Firefighter Challenge has several firefighter themed obstacles that give you a glance of the live of a firefighter. You will battle through 16 different obstacles that will challenge your strength, stamina and endurance. Runners will run the race in a wave format beginning at 10:00 a.m. and every 30 minutes thereafter. This race is open to anyone age 11 and up. This year we are adding an additional Kids 1 mile Mud Run for kids under 10 years old. The kids run will be in/around the Park in Mountain Ranch and will include at least one mud pit. All obstacles for the kids will be the full size adult obstacles to challenge the kids in strength and endurance. 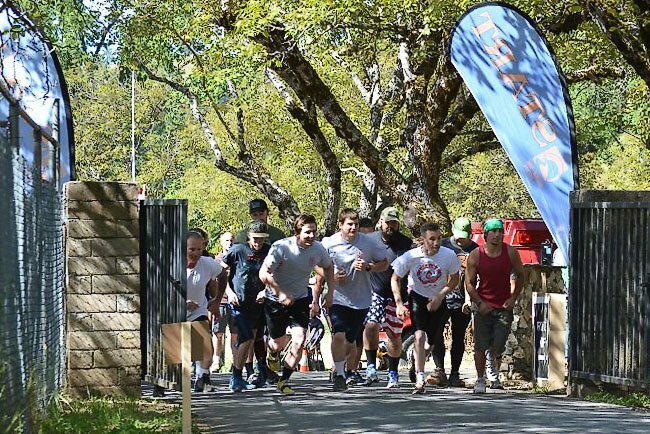 The Stop, Drop & Mud is hosted by the Central Calaveras Firefighters Association. When you run in some of the larger obstacle races you are supporting a company that is hosting the race and then donate a very small percentage of the funds to some charity. Our race is different. Every single aspect of the race is planned, constructed and organized by our Volunteer Firefighters and Association members. Countless hours are spent to get this race ready for our participants. Financially every single dollar that is raised goes directly to supporting Central Calaveras Fire & Rescue Protection District. It is with fundraisers like this that allow the Association to purchase vital equipment for the Department that its dwindling annual budget can’t cover. When you register for the Stop, Drop & Mud you are directly supporting Central Calaveras Fire & Rescue. With this in mind we want to say thank you to everyone who has presently signed up and to those considering signing up! Where does my race registration fee go? All registration fees and sponsorships will go directly to purchase new test equipment for Central Calaveras Fire District new SCBA’s (self-contained breathing apparatus). In 2017 Central Fire purchased new SCBA equipment thanks to our inaugural mud run. Annual testing is required for Department personnel. It is fundraising events like the Stop, Drop & Mud 5K along with grants that allow us to purchase vital equipment for the Department that its dwindling annual budget can’t cover. The Central Calaveras Firefighters Association is a registered 501c3 non-profit. Our tax ID # is 45-2853418.